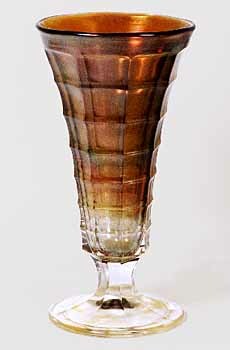 Carl O. Burns, in his 1996 book on Imperial Carnival Glass, calls this pattern Imperial Ranger. 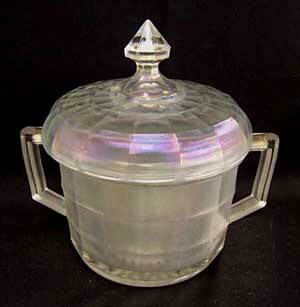 The piece shown here sold in 1993 as Imperial Block and brought $45. It's smoke and 8 inches tall. Another in smoke sold in 2011 for $60. Burns reports sugars and creamers, water pitchers, tumblers, and sherberts. This cracker jar in white, listed in the auction catalog as Imperial, sold in 2006 for $200 and another in white sold for $500 in 2013. Photo courtesy of Jim Wroda Auctions.